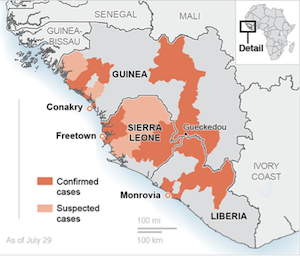 MONROVIA, Liberia — Six U.S. military planes arrived Thursday at the epicenter of the Ebola crisis, carrying more aid and American Marines into Liberia, the country hardest hit by the deadly disease that has devastated West Africa and stirred anxiety across a fearful world. "Our people are dying," Sierra Leone President Ernest Bai Koroma lamented by video conference at a bank meeting in Washington. He said the world is not responding fast enough as children are orphaned and infected doctors and nurses are lost to the disease. Read Friday's Arkansas Democrat-Gazette for more on this story.